It can be imagined that the boundaries of the individual divisions are no longer of equal length, which was essential the case in the previously given example. The movement between two four-divisions of variable sizes needs the definition of a trajectory in order to define the boundaries of the interaction. HOYLE & NARLIKAR (1980) stated a philosophical truth when they noted that man can ‘identify one’s position in space only from local detail not from the large-scale structure of the universe’ and the same holds for a communication-in-general. It is possible to imagine a division and an observer, which is governed by that division, but somewhere a boundary should be fixed – for the time being – to enable a point of reference. The calculation of the shift-values between two revolving four-divisions, which provides the ‘distance’ in a quadralectic communication, is limited by the smallest part which participates in the communication. The theoretical process is clarified in the following way. A (very) Large Part (LP, Major), consisting of the quadrants I, II, III, IV is interacting with a very Small Part (SP, Minor), consisting of the quadrants 1, 2, 3, 4. The image of a slide ruler (a calculating apparatus, which is now in a museum since the computer has taken over his job) can be used here. A more realistic and enduring example is provided by an image of two wheels touching each other and moving at a different speed. The (very) large wheel is called the Major and the (very) small wheel is named the Minor. The introductory setting of a theoretical quadralectic interaction is given in fig. 30. The A-row of shift-values (0 6 8 6) is proposed for the initial valuation (of the shift between the two four-divisions). Furthermore, a situation is visualized in which the Minor or Small Part (SP) approaches the Major or Large Part (LP) from the left, i.e. the Fourth Quadrant of Minor (SP) approaches the First Quadrant of Major (LP). Later, the various other possibilities of interaction will be studied. The Minor is situated in this arbitrary position in the space ‘before’ the First Quadrant of the Major (LP). This means, in a cyclic setting, in the Fourth Quadrant of a previous cycle of the Major. The ‘space’ can therefore be valued with a 6, the last number in the CC-sequence of the A-row: 0 6 8 6. The Small Part (SP) is – in this theoretical setting – completely embedded in the last quadrant of the previous cycle of the Large Part (LP). No actual size of the participating four-divisions are given. Only, by definition, that the Major is much bigger than the Minor. Fig. 30 – A graphic representation of the approach (from the left) of a Minor or Small Part (SP) to the First Quadrant of a Major or Large Part (LP). The Small Part (SP) is in this situation situated in the Fourth Quadrant of the Large Part (of a previous cycle). The sum of the differences of the communication coefficients (CC) – measured over the communication trajectory (CT) – provides a number, which indicate the shift between two communication partners. The new unit is called the communication factor (CF). The calculation is given in fig. 31. Fig. 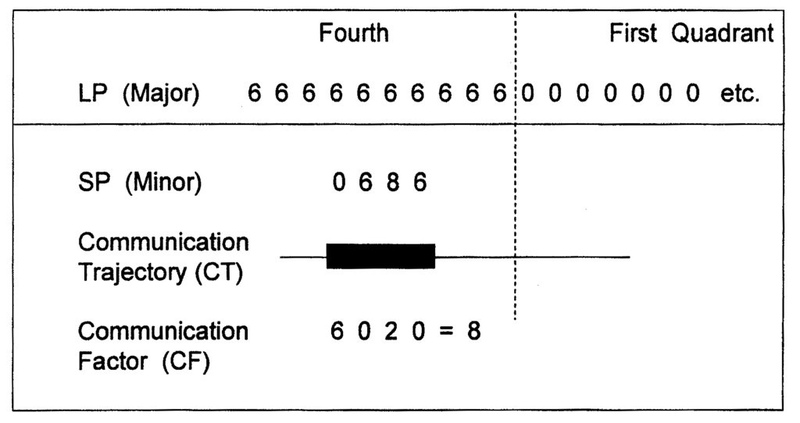 31 – A calculation of the sum of the communication coefficients (CC) over the communication trajectory (CT). The communication factor (CF) is the sum of the differences between the communication-coefficients (CC’s), calculated over the communication trajectory (CT). The communication factor (CF) is the most important unit of measurement in the quadralectic philosophy, because it defines the shift between the communication partners over a given trajectory. It is not a particular point, but gives a range. The CF-value is an indication for the state of affairs in a communication over a certain trajectory. A single (numerical) figure acts as in indicator for a distance between communication partners. However, it has to be remembered that this figure (of the CF) is also related to the length of the Small part (Minor), i.e. the part, which determines the width of the communication. The next phase in the shift of the Small Part (or Minor) along the Large Part (LP) – still to the right – involves the ‘intrusion’ of the Fourth Quadrant of the Minor into the First Quadrant of the Major. This new situation cannot be measured at first, but the circumstance change when the boundaries of a compartment of the Minor coincide with those of the Major (fig. 32). Fig. 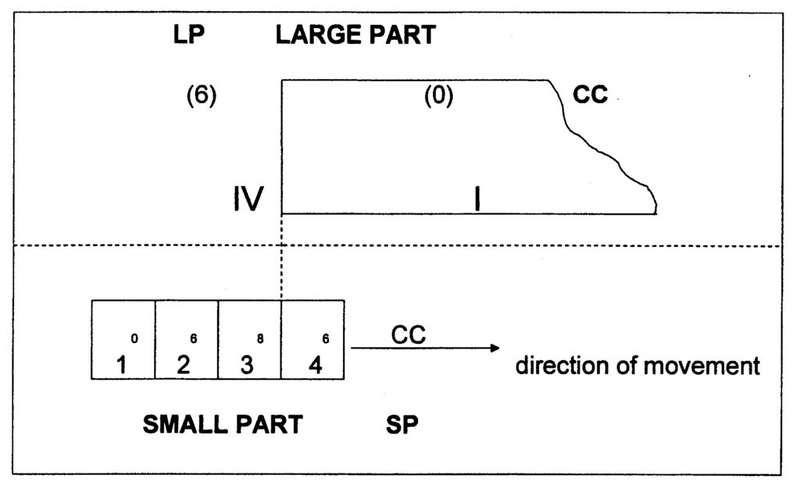 32 – A Small Part (SP) approaches a Large part (LP) from the left and the boundary of the third and fourth quadrant of the Minor (SP) coincides with the beginning of the first quadrant of the Major (LP). A measurement of the differences in communication coefficients (CC’s), generated in a linear shift movement between divisions, can only be made when boundaries (of subdivisions) coincide. 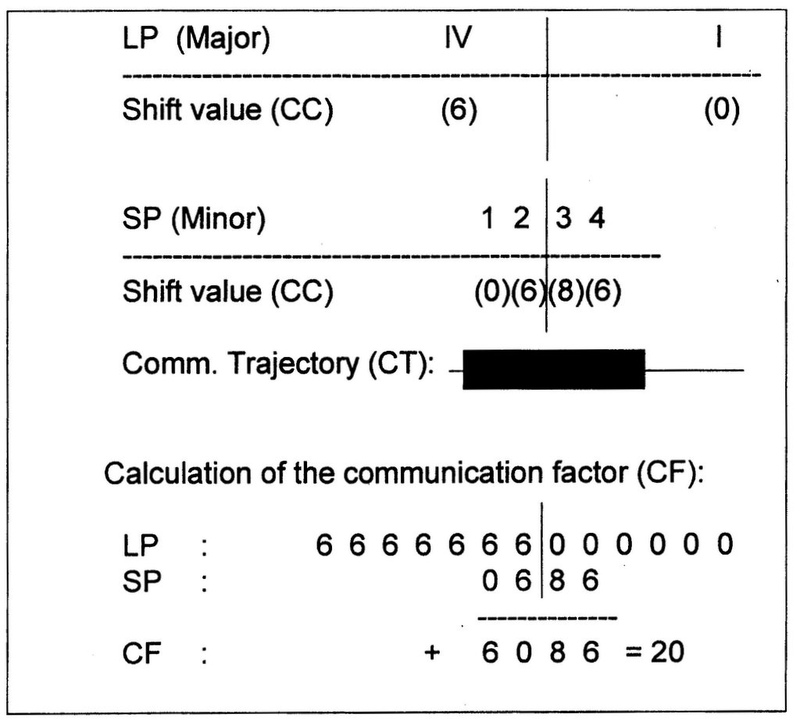 The following communication factor CF (fig. 33) can be calculated in the shift situation, as given in fig. 32. Fig. 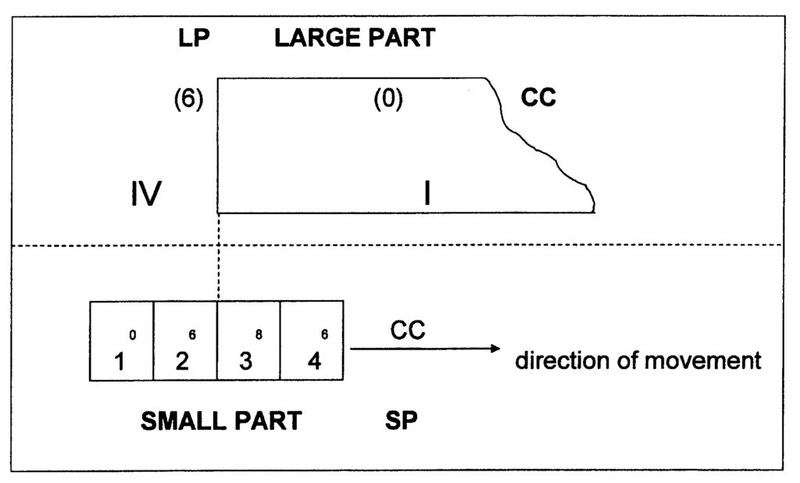 33 – The calculation of the CF-value when a Small Part (SP) moves along a Large Part (LP) from left to right. The boundary of the third and fourth part of the Minor (SP) coincides with the boundary of the fourth and fist part of the Major (LP). Again, a phase of immeasurability occurs when the movement of the Minor (SP) continues along the Major (LP). This part of the trajectory is the ‘in between’. This area is known from Zeno’s paradox of the tortoise and the hare (or Achilles), but its purpose is now different. The dichotomy argument (of an ever decreasing two-division) is not the aim, neither a refution of motion. The ‘empty’ area does not point to itself, but to the reference points, which delimited the void in the first place. Motion is accepted as a necessary element of a communication (just like division). The quadralectic communication process consists of a specific number of observation- and/or measuring points and countless points ‘in between’, following each other in a cyclic sequence. The immeasurable entities in an interchange are just as important for the character of the shift-as-a-whole as the fixed points. No measurements are possible if that imaginary space does not exist. The philosophical con-sequences are incorporated in the quadralectic way of thinking. The First Quadrant will always remind an observer that a certain area of a commu-nication is behind observation and direct empirical proof is missing in part of the specter. The next point of measurability (following the previously given example of a SP passing along an LP to the right) takes place when the boundaries of the 2-3 quadrant (of the Minor) coincide with the beginning of I-quadrant of the Major. This position is represented in fig. 34. Fig. 34 – The boundary of the second and third quadrant (2-3) of the Minor (SP) corresponds in the situation above with the beginning of the Major (LP), i.e. the boundary between the fourth and first quadrant (IV-I). The actual size of the shifting compartments is not of influence on the calculations, which are made on a theoretical level. The calculation of the communication factor (CF) takes place by a sub-traction of the four appropriate CC-values over the communication trajectory (CT). Fig. 35 provides the figures if the boundary of the second and third quadrant (2-3) of the Minor (SP) corresponds with the ‘beginning’ of the Major (LP). De CF value is, in that situation, 20. Fig. 35 – An example of the calculation of the CF-value in a hypothetical linear shift-model between two four-divisions. The Small Part (SP) passes here, from left to right, along a Large Part (LP). The boundary of the second and third quadrant of the SP (2-3) corresponds with the beginning of the first part of the LP (IV-I). The final CF-value is calculated over the communication trajectory (CT), which is governed by the size of the smallest part. The generation of measurable points continues during the course of the Minor along the quadrants of the Major in very much the same way as before. After the First Quadrant (I) of the Major (LP) has been passed by the Small Part, it will continue its route along the Second (II), Third (III) and the Fourth Quadrant (IV). In the end, all the quadrants of SP (Minor) have moved along all the quadrants of LP (Major), and the communication trajectory will be ‘completed’. The calculation of the CF-values of a full shift-sequence (of one communi-cation cycle) is given in fig. 36. The CF-values are graphically represented in fig. 37. This sequence of the measurable points indicates the relative ‘distances’ between any given LP and SP, which partake in a communication. High values of the communication factor CF – the maximum here is 26 – convey a greater distance or divergence. Low CF-values – the minimum is 2 – point, on the other hand, to a diminished distance or convergence. A (full) shift of two communication partners (expressed in four-divisions) results in a continuous action of convergence and divergence. Fig. 37 – The thirty-two (32) basic situations in a shift between two abstract four-divisions. 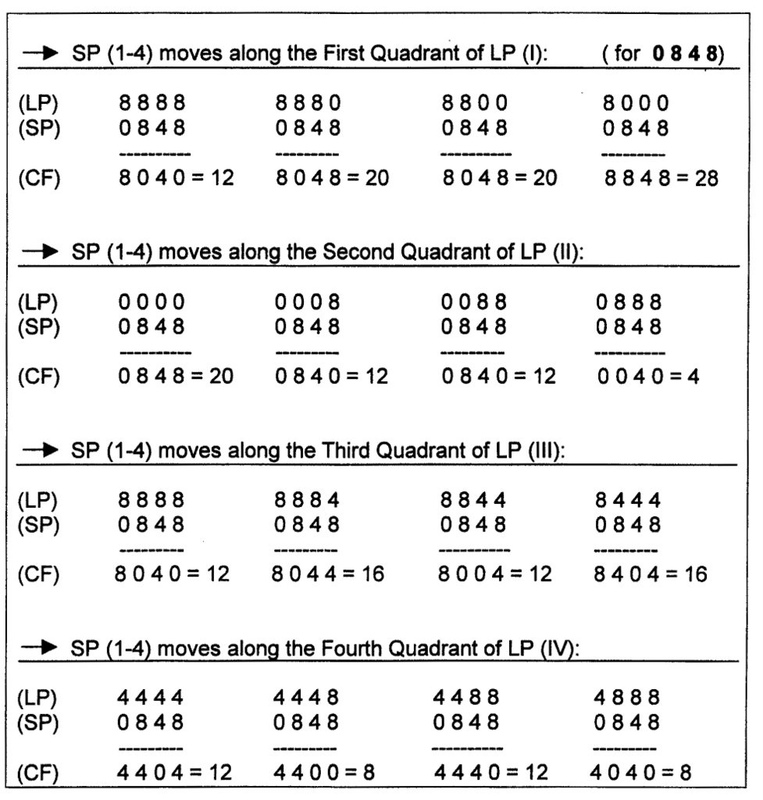 The Major (LP) consists of the quadrant I – IV and the Minor (SP) comprises the quadrants 1 – 4. The displacement sequence 0 6 8 6 (A-series) is used here and the Minor (SP) moves from left to right. The numbers underneath the sixteen shift blocks give the value of the communication factor (CF) at that particular situation. The alternation of measurable and immeasurable blocks find its origin in a coincidence of boundaries or the absent thereof. A CF-sequence is a collection of CF-values, which is generated when two communication partners perform a complete shift over the communication trajectory. The process of shifting quadrants must be fully understood before we can continue to other possibilities and directions within a communication. The aim of the present inquiry is the creation of a value-system, which is independent of the direction of approach. The quadralectic valuation takes full advantage of the cyclic nature of an interaction and eradicates all references to a particular direction within a shift. The above-given procedure was based on a move from left to right and now a shift from the ‘opposite’ direction will be investigated. Fig. 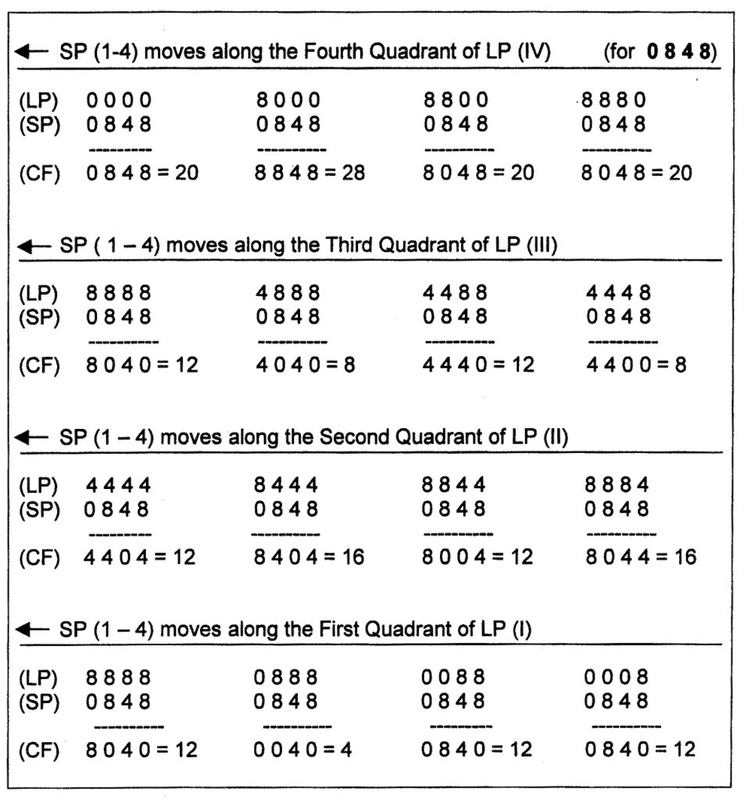 38 gives the example of a dynamic SP (Minor) approaching a static LP (Major) from right to left. Fig. 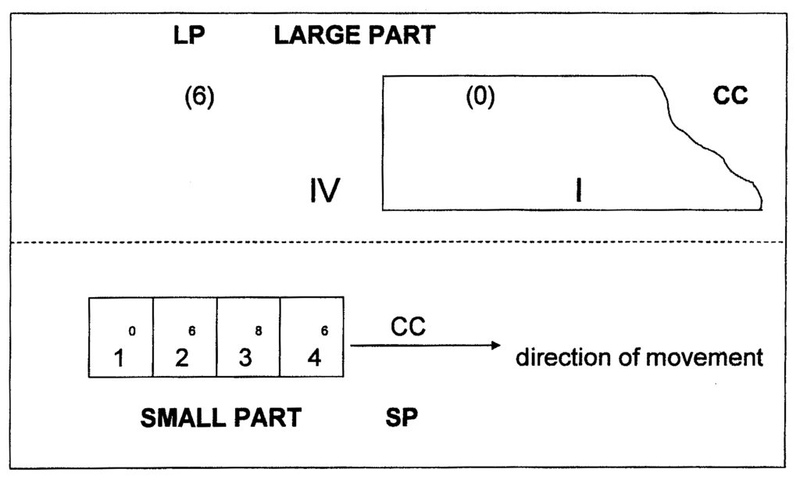 38 – A dynamic SP (Small Part) moves from right to left along a static LP (Larger Part). The illustration shows the moment when the first quadrant of the SP (1) comes in contact with last quadrant of the LP (IV). The subsequent quadrants of the SP will cross the same boundary one after another. A measurement (of the CC differences) will be possible if boundaries coincide. Fig. 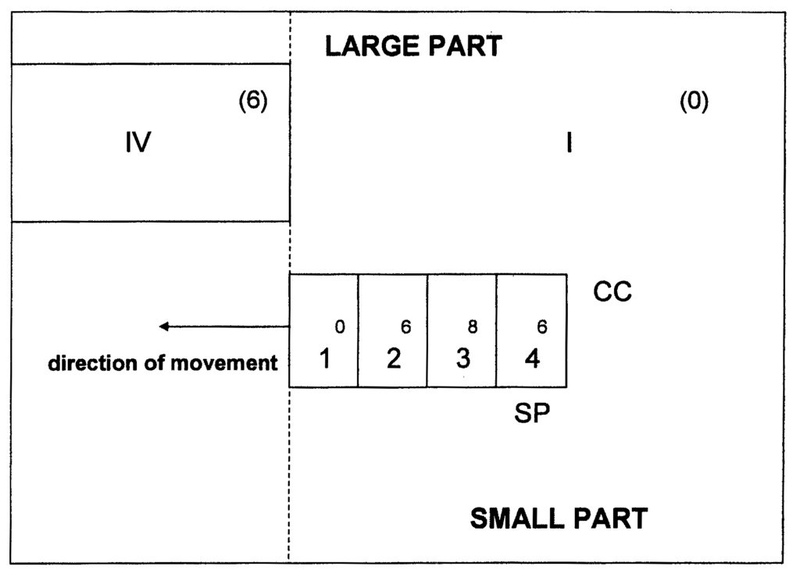 40 – This scheme gives the combination of the four possibilities of movement in the linear interaction between a Large Part (LP) and a Small Part (SP). 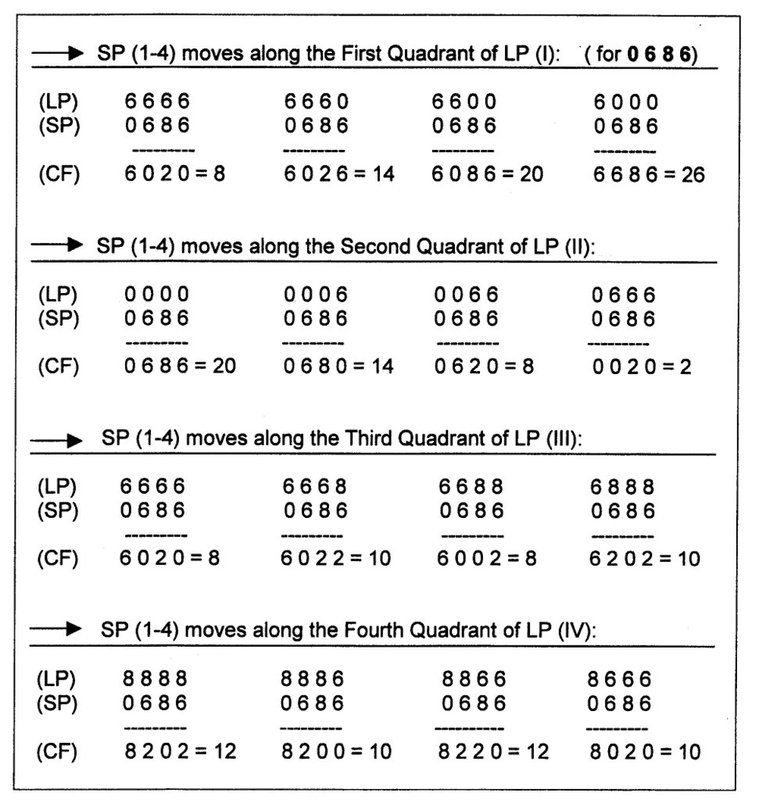 Two sequences will always be the same, that is to say: the sequence of ‘LP-to-the-right’ is equal to ‘SP-to-the-left’ and the sequence ‘LP-to-the-left’ is equal to ‘SP-to-the-right’. This sequence of CF-values is called the First Standard Sequence (FSS). The series gives an indication of the distance between partners in a four division, calculated over the communication trajectory (CT) (limited by the Smallest Part). The interchange is valued by the CC-sequence (0 6 8 6) and is independent of the direction in which the divisional parts move along each other. The investigation into the character of shifting four divisions has come up with its first (visible) result. Such an entity points to a ‘Third Quadrant’. The general (cognitive) position, however, is still situated in the Second Quadrant. All the exercises so far – in the form of divisions and shifts (movements) – partake in the development of an idea, which will only find its complete usefulness as an application in the fourth part of the Second Quadrant. 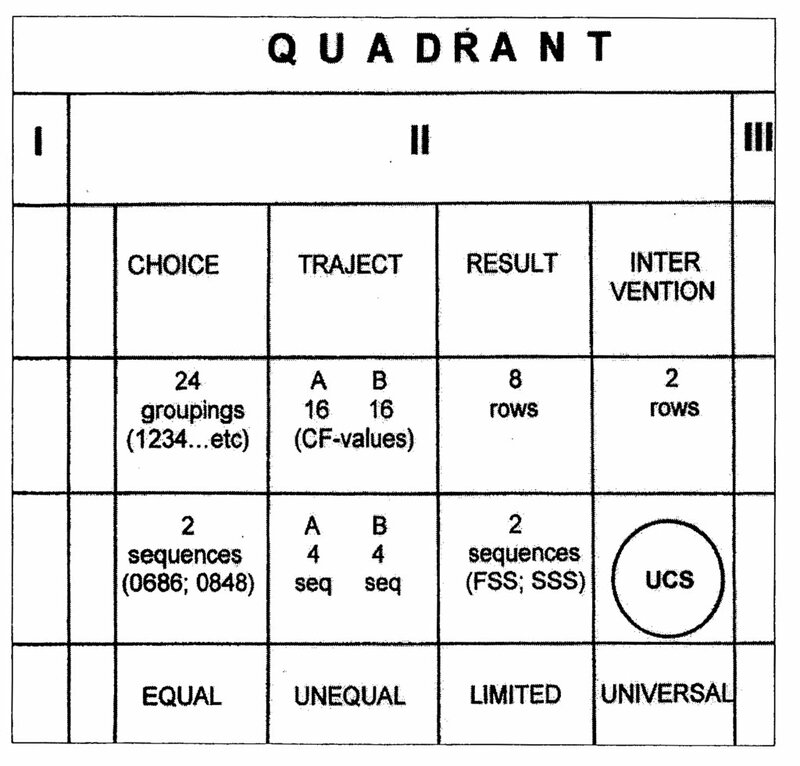 The outcome of the First Standard Sequence (FSS) has to be placed in the third part of the Second Quadrant (II, 3) and regarded as a preliminary and incomplete result. The FSS is not the end of the story, because all the possibilities are not exhausted. There is still in the background the second displacement series, consisting of the CC-sequence 0 8 4 8 (the so-called B-sequence). This valuation unit has to be included in the calculations to achieve a ‘universal’ parity of communication. The character of the Third Quadrant casts here, in the third part of the Second Quadrant (II, 3), its shadow before. A visible result, as an empirical entity, is never alone in the Third Quadrant. It will always be part of a duality that is the very nature of the position in the visibility specter: a result can only be seen (measured) in relation to something else. The movement of the Minor along the Major (two possibilities) and the opposite movement of the Major along the Minor (two possibilities) trails the same path as previous followed, but now for the CC-sequence 0 8 4 8 (fig. 41). The sequence of measurable points indicates – just like it did in the shift based on the 0 6 8 6 sequence – the relative distances between the Small Part (SP) and the Large Part (LP). 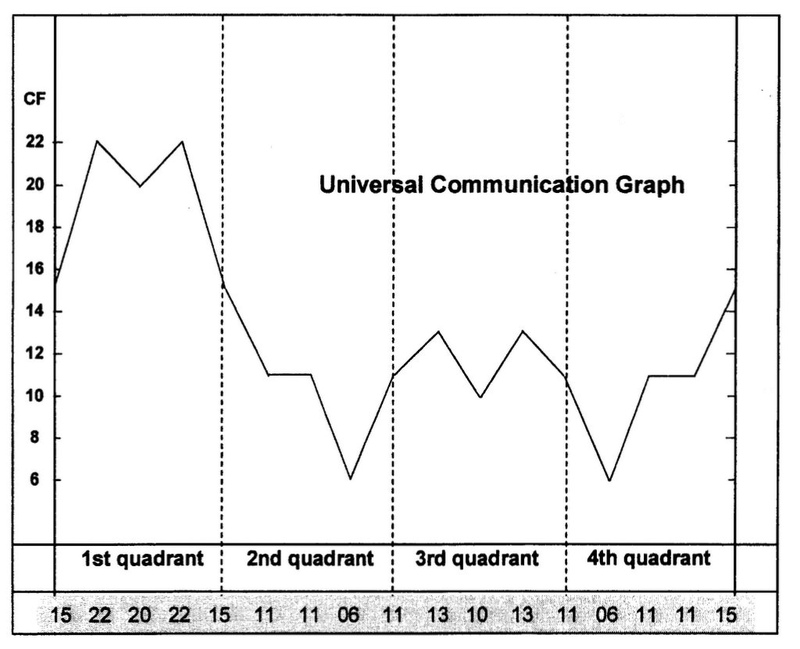 The highest value (or greatest distance between the communication partners; also called remissio) is now 28, and is reached in the fourth position from the left. 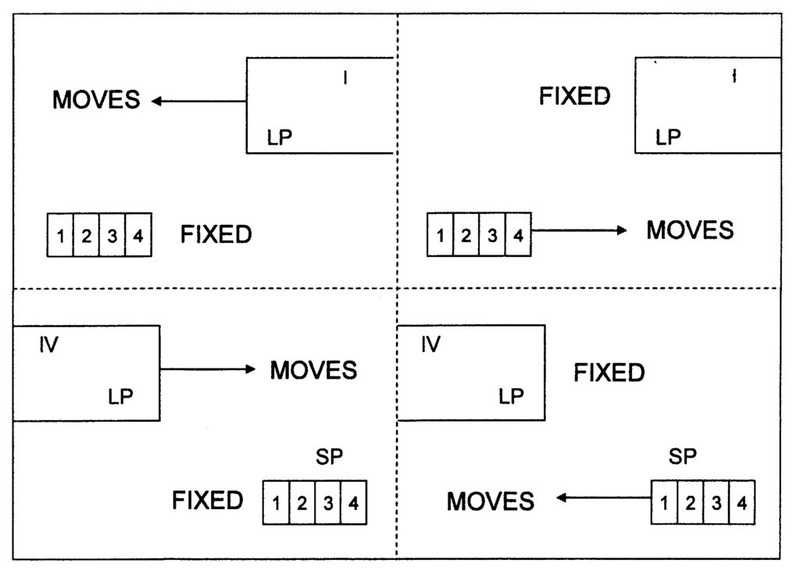 The lowest CF-value is 4 (greatest proximity of the communication partners; or intensio), is attained in the eighth position from the left (fig. 42). Fig. 42 – This scheme gives the thirty-two (32) basic situations in the shift between two abstract four-divisions, with the second CC-sequence (the B-sequence 0 8 4 8) as a calculation unit. 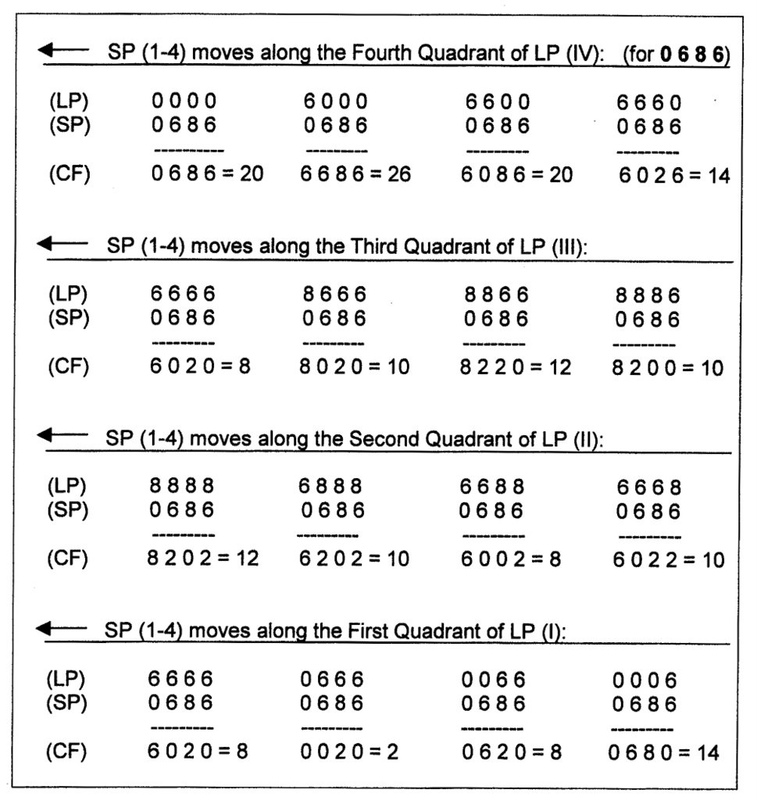 The SP (Minor), consisting of the quadrants 1 – 4, moves from left to right along a LP (Major) comprising the quadrants I – IV. 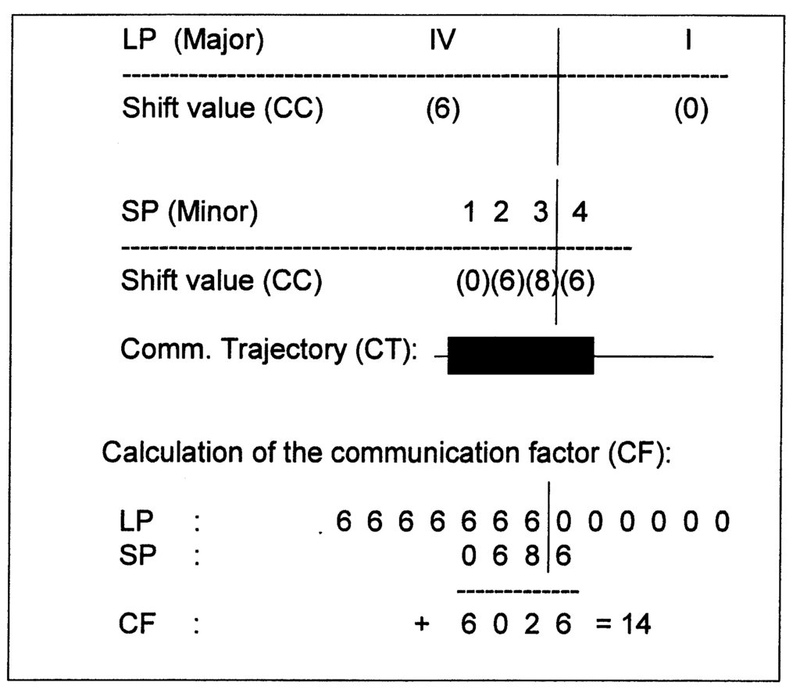 The number under the shift indicates the communicationfactor (CF), which can be calculated in that particular situation. The next consideration will be an approach ‘from the right’. This means that the SP (Minor) moves along the LP (Major) from right to left. The first quadrant of the SP enters, as a consequence, from the huge space of the first quadrant (of a following cycle) into the last quadrant of the LP (Large Part). Subsequently, the Minor passes along all the other quadrants of the Major in a reverse order. This movement is given in fig. 43. 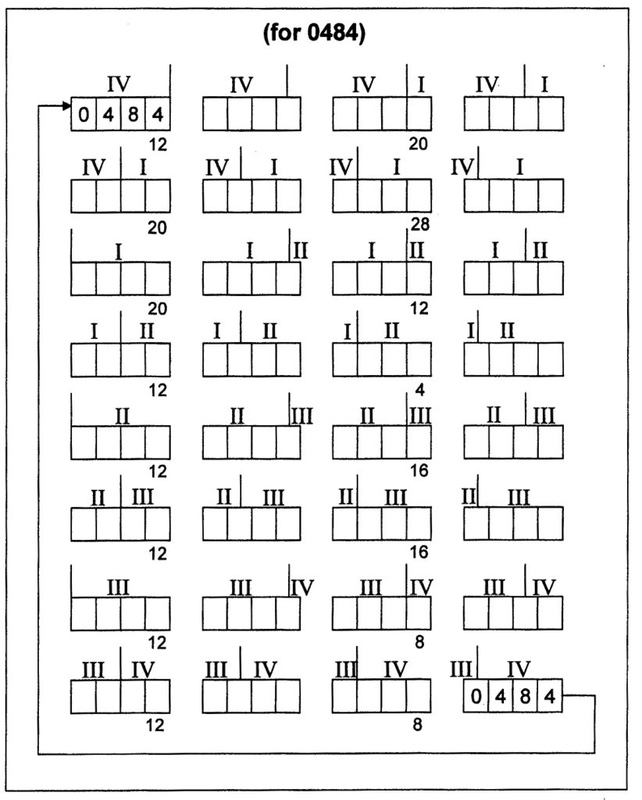 This sequence of CF-values, based on the displacement series 0 8 4 8, is called the Second Standard Sequence (SSS). The sixteen numbers are derived from a second path of thinking with a different displacement series (the B-series) as a point of departure. Again, the row of consecutive CF-values gives an indication of the distance between partners in a four division, calculated over the communication trajectory (which is limited by the Smallest Part). The interchange is now valued by the CC-sequence (0 8 4 8) and is independent of the direction in which the divisional parts move along each other. The subsequent position of the SSS is, just like the FSS, in the third part of the Second Quadrant (II, 3). Together they form a duality in which every interaction between (quadralectic) communications partners is caught. The ‘story board’ of fig. 44 gives an overview of the lines of thinking, which has been followed so far. The various technical operations (of division and shift) find their place within the subdivisions of the Second Quadrant, aiming at the ultimate goal (idea) of finding a universal representation of a four-fold communication. Fig. 44 – The lines of thinking in the Second Quadrant (II) of a quadralectic communication indicating the various cognitive actions in the subdivisions. UCS is the Universal Communication Sequence. The final calculation is to join the two standard-CF-sequences (FSS and SSS), i.e. the one derived from the A-sequence 0 6 8 6 and the other acquired from the B-sequence 0 8 4 8 and take their average value. 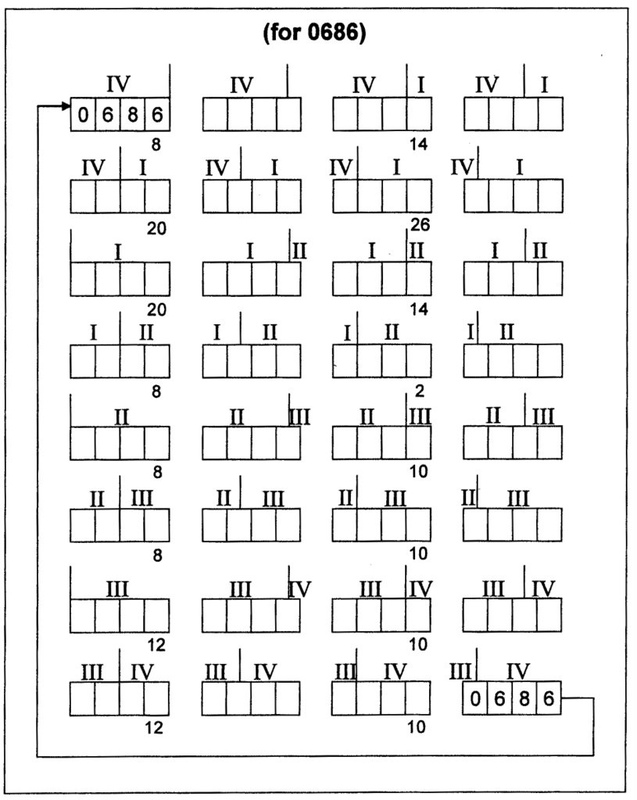 This CF-sequence is called the universal communication sequence (UCS) and can be expressed as a universal communicationgraph (fig. 45). This sequence (or graph) is by far the most important expression of the quadralectic way of thinking. The CF-graph is a universal representation of the receding and approaching actions, which takes place between communication partners in any conceivable interchange based on a four division. An important point must be made here before we accept this graph as ‘universal’. The primary fragmentation offered twenty-four (24) possibilities to arrange a four-partition. Sixteen (16) of them gave, after an internal shift, the A-sequence (of the CC-values 0 6 8 6) and eight (8) produced, after internal shift, the B-sequence (of the CC-values 0 8 4 8). The question can be raised if this difference in the number should not be taken into account when the final average is calculated. In other words: to count the sixteen possibilities of the A-sequence proportionally more than the eight possibilities of the B-sequence, i.e. in the proportion of two to one. The fundamental choice between a weighted average (2:1) and an equal contribution (1:1) to the outcome confronts the observer with a renewed awareness of the position in the process. The creation of the Universal Communication Sequence (UCS) comprises the reduction of two standard sequences (FSS – SSS) into one, universal sequence. The place of action (see fig. 44) is the transition between the preliminary results in the third compartment of the third division of the Second Quadrant (II, 3,3) and the ‘final’ result in the third compartment of the fourth division of the Second Quadrant (II, 4, 3). The ultimate result (UCS) is reached in the third compartment of a ‘Fourth Quadrant’ (in the Second Quadrant) and can be seen as a new entity. The outcome presents itself as a part in a ‘Third Quadrant’ setting. This position implies a dualistic nature, just like all delimited entities in the (official) Third Quadrant. Visible visibility (of a part) can only exist with a counterpart. This elementary statement also holds as well for the single, universal commu-nication sequence created in the penultimate stage of the Second Qua-drant. The handling of the two types of calculations is a noticeable ‘weakness’ in the objectivity of the result (the UCS). The necessity to make a choice or subjective intervention is the only way to go beyond the constraints of oppositional thinking. The two primary results (FSS – SSS) offer a space of interaction in the dynamic fourth subdivision (of the Second Quadrant). The choice (between the valuation of two types of sequences) creates a fresh opening and leads eventually to a universal unity. The application of a weighted average (or pro-rata contribution) is a formal ‘Third Quadrant’ solution, with the emphasis on the number-as-part. The calculation of the average (of FSS and SSS) follows the rules of arithmetic and uses the ratio (2 : 1) in a consequent way. The use of the equal contribution is rendered as a ‘Fourth Quadrant’ solution, with the emphasis on the dynamic aspect of the number-as-multitude. The difference between the draw ups (fig. 46) lies in a slightly lower remissio in the First and Third Quadrant (lower CF-values) in the pro-rata graph. Furthermore, the absence of the areas of equilibrium in the second division of the Second Quadrant and the third division in the Fourth Quadrant is noteworthy. The boundaries of the Third Quadrant are not fixed at the value of CF = 11, as in the case of the UCS, but they have a somewhat lesser value. The points of maximum intensio are the same in both graphs (CF = 6). The shape and values of the two graphs do not, in general, differ a great deal. Therefore, the choice between the rounded figures – as a result of the equal distribution (1: 1) – in favor of the broken figures of the pro-rata distribution (1 : 2) is chiefly inspired by a practical attitude. The option of the equal contribution, as a ‘Fourth Quadrant’ solution with the emphasis on the Multitude, has been chosen to form the final CF-sequence. Higher division thinking can handle this choice, which fits better in its own character. Fig. 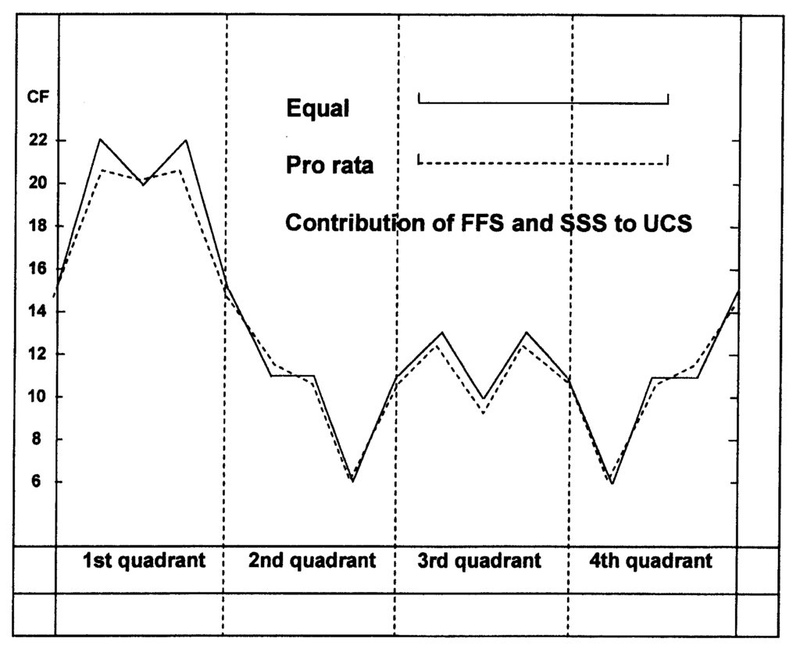 46 – The upper figure gives the differences between the CF-graphs constructed on the base of an equal and a pro rata contribution of the A and B sequences (FSS and SSS) to the UCS. 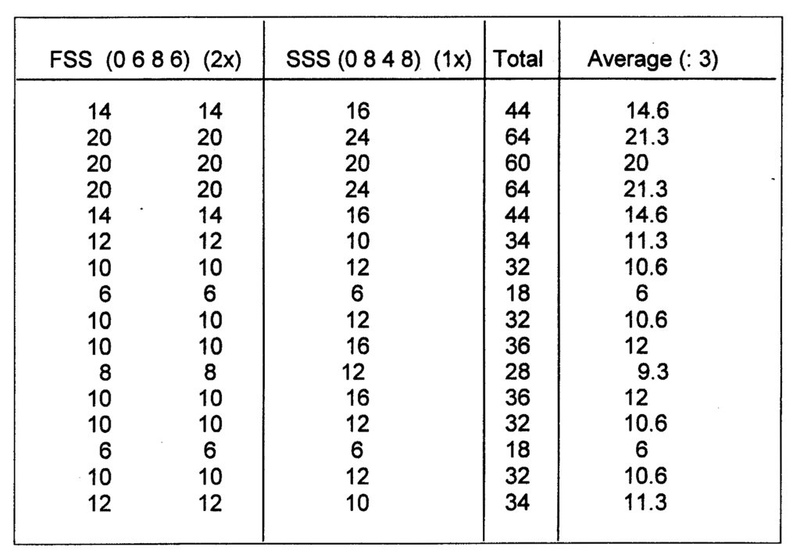 The lower table shows the calculations of the weighted averages. It is worthwhile to pause at this point of the inquiry to recapitulate once again the mental track, which has been followed so far (fig. 47). Every step must be meticulously charted and understood when the first general picture emerges. Quadralectic thinking has its own logical way. 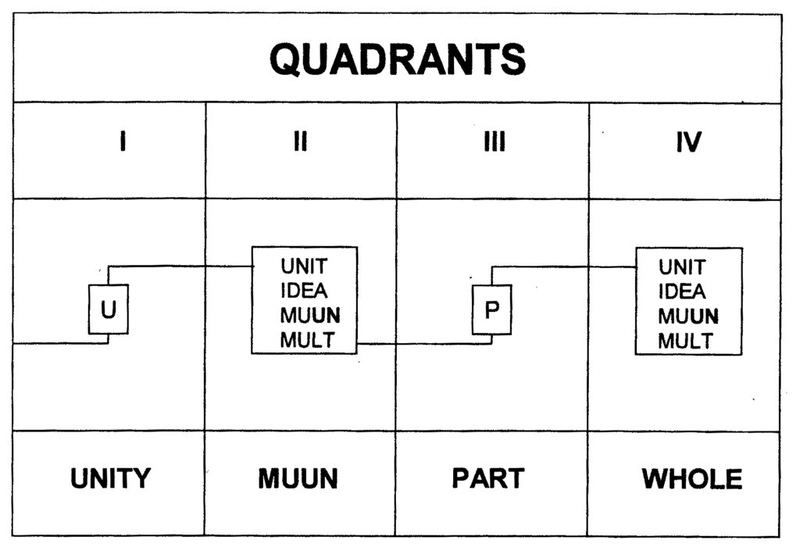 The primary operation of division and shift is situated in the Second Quadrant, but the characteristics of the Third and Fourth Quadrant made their presence clear in advance (in the subdivision). The wider setting of the various cognitive actions is present in the early stages of a communication. The procedure in the Second Quadrant is an anticipation of the things to come. The cyclic setting means that all things are already there, as pack and parcel of visibility-as-a-whole. Fig. 47 – This diagrammatic scheme illustrates the intellectual journey into a comprehensive communication based on a four-fold division. The relationship consists of a unity (in the First Quadrant), which is fragmented by a four division in the Second Quadrant. The integral communication is enacted in this quadrant. The unity gives rise (after division) to an idea (of movement). The resulting interaction (of subdivisions) can be validated as a muun (multi-unity). This ‘virtual’ entity can act as a new standard (of measurement) in a (visible) multitude. An area of subjective intervention (UN; dark outlined) is essential in the continuation of the interaction. The path through the subsequent stages of interaction between the four divisions of a communication is a reflection of the way of thinking itself. The actual procedure consists of four major stages in which human thoughts can dwell. Firstly, they can be located in the unity of the undivided (static) presence, without any visibility. Secondly, they concern themselves with the division/fragmentation into units (a muun) and – simultaneously – a shift of those (sub) divisions. Visibility (in the form of repeated recognition) is gained in this process. The third (static) step is the creation of a unit of measurements (a part), derived from the chosen division. An actual empirical presence or visible visibility can be achieved at this stage. The fourth and final move is the implementation of the unit (of measurement/the part) in a dynamic interchange with other units (parts), leading to a new understanding of the whole. This procedure is, in a nutshell, the four-fold way of thinking (or as it was called in an earlier version: the Tao of quadralectic thinking; see p. 82, fig. 24). It brings about the quadralectic vision in a logic sequence of actions and ends in a tool (the CF-graph) to tackle every possible communication.